More non-competition variations for my “Dimpled Diamonds” sock pattern, released to participants in Sock Madness 3 on Tuesday, 12 March, now that the round has closed. (I’m writing only the *modifications*, for you to pencil them into your margins.) I enjoyed knitting this pattern, and I sincerely hope that you will too! Rd 5: K 18, sl(p)3 . . . .
Rd 8: K2, k2tog, k to last 4 sts, ssk, k2. Rd 9: K 14, sl(p)3 . . . .
Rd 12: K2, k2tog, k to last 4 sts, ssk, k2. Rd 13: K 10, sl(p)3 . . . .
Rd 16: K2, k2tog, k to last 4 sts, ssk, k2. Rd 17: K 6, sl(p)3 . . . .
Rd 21: K 3, sl(p)3 . . . . Your final expansion rd will be Rd 25, instead of Rd 29 like the other sizes, but the same directions will work for you. Follow them as written in the pattern from here on. For a narrower foot overall, see previous post from 5/13. Q: What does the term “touch-down stitch” or “anchor stitch” refer to? 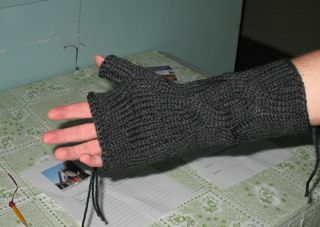 A: That is my own term for the single knit stitch after a long run of slipped stitches; not a special technique, just a shorthand term that I can then use later on in the pattern. 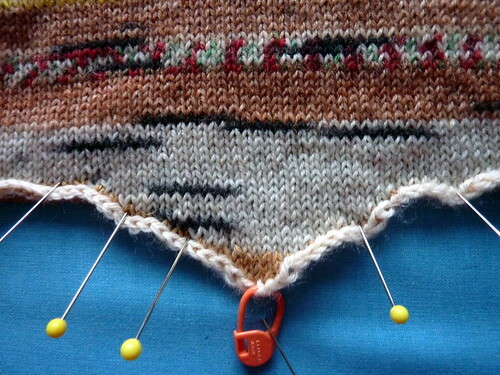 Q: When you “knit under” the strand, are you knitting that as a new stitch? A: No, you’re knitting a stitch in the current row, but reaching your right needle tip under that loose strand on the front 2 rounds down before you do it. 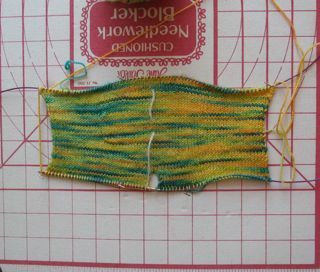 This tucks the strand around behind the new stitch, thus the term “tuck stitch”. Your stitch-count should not change. Q: Does it matter exactly where I start the arch-shaping? A: No, but be sure to do it before the heel, so that your stitch-count will match the pattern as you go forward and your arch/instep will have enough room in the sock. No news yet on my resubmitted Level 2 materials. DH mailed the box on Friday and I don’t expect the reviewer to receive it until the middle of next week. 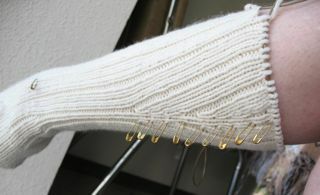 I’ll work on and post about other stuff in the meantime . . . .
At least 2 knitters have finished their socks (wow! ), so I think it’s “safe” now to post some non-competition-appropriate variations. First installment is a version that is narrower overall, as I made my prototype. This width takes less yarn: I used only 74 grams/280 yards of Shepherd Sock stripey yarn. Later on, I plan to post changes to narrow only the ankle. Errata found so far: — Mark these on your pattern!! The center-back marker needs to go after st #19 and not after #18. I think all the instructions after that are correct (the “k18, slip 3,…” ones), once the marker is in the right place. You’ll know your Rd 5 is right if you slip the last 2 sts on heel ndl and the 1st st on instep ndl and your touch-down st is directly above the tuck-st of previous set. Toe, Round 2, the bracketed instructions should read: “k1, kfb, k to last 3 sts on ndl, kfb, k2”. Foot, Rd 9, instep should end with “k4”, to make 5 knit sts altogether. Ankle, Rd 3, the marker should go after st #19, and the plain round before the final expansion is Rd 28, not Rd 29. Competitors must work the pattern as written, but non-competitors who want an overall narrower foot on their Dimpled Diamonds socks may make the following modifications. Same toe, but stop when you reach 29 + 29 = 58 sts. Patt Rd 3: K5, dip-&-tuck . . . .
Patt Rd 5: K2, sl(p)3 . . . .
Patt Rd 7: K2, dip-&-tuck . . . .
Patt Rd 9: K 3, sl(p)5 . . . .
Patt Rd 11: K 5, dip-&-tuck . . . .
At 5 – 5 1/2″, add 3 pairs of sole sts, as directed, unto 29+35= 64 sts. Work heel as directed, but on 35 sts. So your first turn will be between sts #34 and #35. Slim = decrease a pair of sts on rd 8 and on rd 12, unto 60 sts. Avg = increase 1 pair of sts on rd 4, unto 66 sts; perhaps use smaller ndl on cuff-top. Wider = inc 1 pair of sts on rd 4, also unto 66 sts; larger ndls throughout ankle and cuff. You can probably work out the ankle pattern expansions yourselves by eye, having gotten this far with the Quilted Lattice stitch-pattern, but you can contact me via the Comments section if you need further assistance on this. I do not have numbers specifically for wider feet. Perhaps either the medium or narrow sizes, worked at a larger gauge and/or in a thicker yarn, would work for you. Or, if you feel more confident, add more stitches in the toe and add more reps to the Quilted Lattice pattern on the instep; just make sure you have a multiple of 6 stitches by the time your pattern joins up at the ankle-back. Customizing for higher insteps may be accomplished by adding more stitches at mid-foot and decreasing them (or not, if you also want a wider ankle) at ankle-back. Just make sure you have a multiple of 6 sts before the pattern joins up at center-back. I will post modifications for narrowing the ankle portion on the medium-width sock after all the official competitors have passed that point in their race. Those aspen buds I posted last week have been growing. But we also have some “volunteers” coming up in undesireable places. I think I’ve finished my last resubmission knitting! More later. Toe, Round 2, the bracketed instructions should read: “k1, kfb, k to last 3 sts on ndl, kfb, k2“. Foot, Rd 9 should end with “k4” instead of “k5”, to make 5 knit sts altogether. Ankle, Rd 3, the marker should go after stitch #19, and the last plain round before the final expansion is Rd 28, not Rd 29. I’ve also finished another swatch to resubmit. Here’s the original Swatch #14 – Cable #1, “Wave Cable”. Seed stitch in Cascade 220 certainly does loosen up when wet! But I’m hoping this swatch’s borders will pass muster. I didn’t attempt to straighten the edges fully, but let them flare; judge said of Swatch #16 that the ” flare in the borders as been successfully managed,” so I’m not so worried that the un-compensated borders be flare-less. Would you agree? 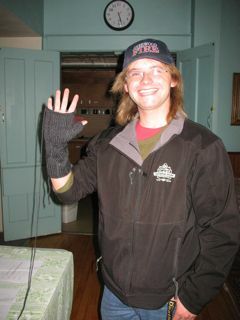 Not a whole lot of knitting going on; that is to say, a variety of projects tackled, but not very many inches produced. My neck has been bothering me enough that there were several days this week that I just could not knit; plus a day I took off on principle. My current Square-Top Cap is down to the ribbing. I’m planning a turned-up brim on this one. Uses 80 stitches, to be larger than my usual (lately) 72 sts. And I’ve progressed on my Multi-directional scarf in Twisted “Duchess” (DK-weight) yarn, colorway “Rodney”. And I’ve been swatching some Wisdom Yarns “Poems” in entrelac. 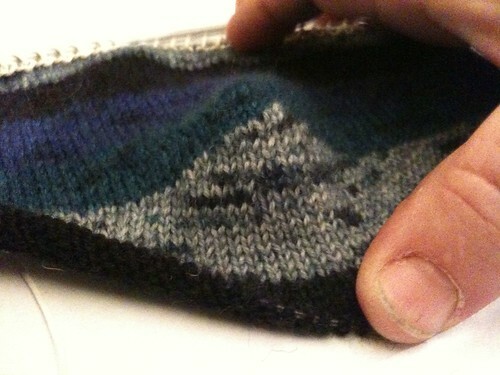 On the second of my Purl-sided Socks, I’ve reached the instep-increases. 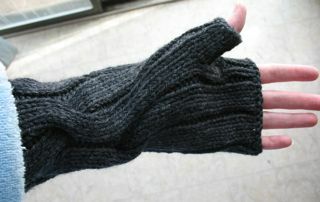 (Due to the curl of the purl side-panels, they look quite funny with no feet in them!) I’m deciding between 2 heel-possibilities — not an exact match to the first sock — keeps it interesting! And I have an idea for a next pair. . . . (Discipline, discipline! Pace it out.) These would be for my mother, I think, in Classic Elite’s “Alpaca Sox” yarn, using one of Cat Bordhi’s architectures in New Pathways for Sock Knitters (Book One). I’m especially looking for that great idea for *next year’s* Sock Madness. . . . Speaking of Sock Madness, Round 1’s pattern will be released this coming Thursday morning and the competitors are chomping at the bit over on the Ravelry discussion board. This one is NOT my pattern, but I hope they will yet use mine — it has been featured in one of the teasers! Again this year, as last, I am not competing, but watching from the sidelines and enjoying all the hooplah. Seeing the teasers has made me wish I could get all those patterns, but. . . not this year. Winter and spring continue to wrestle for dominance (as a devotional I read recently put it). Eventhough we know who wins, it’s entertaining to watch the process. Our weather is warming up this week, and the dormant lawn in starting to show again, from under the snow. 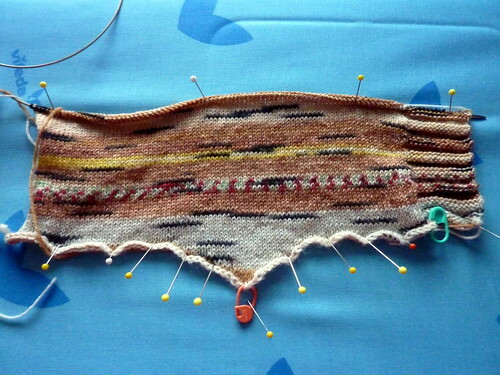 Knitting-wise, today, I’m fiddling around with some child-sized socks as prototypes for an idea I want to explore. When I’m testing a design idea, I often wish knitting went faster, so that I can see the results — good or needing refinement — while it’s still fresh and my mind is still turning. So, here, I’m using biggish yarn and knitting for a smallish foot. 😀 I don’t want to wear myself out — my neck is acting up something fierce! — but I SOOO want to see if this pans out! Speaking of sock designs, Sock Madness 3 is taking sign-ups *NOW*, from Sunday 1 March until 6 March, OR until they’re full at about 200. If you’ve ever thought you might like to get in on the fun crazies that are the Sock Madness speed-sock-knitting contest, send the coordinators an e-mail pronto! The US Postal Service tells me that my box of Master Knitter materials arrived in Ohio this past Tuesday — hurray! So by now it will have been sent on the first reviewer. I don’t expect to hear until the entire process is complete and several people have evaluated my work. Then, I’ll get my box back with notes included. Waiting. So, what are YOU currently waiting for? Are you trying out a new idea? And made sure all the projects were tagged and bagged. And boxed it all up, with padding for protection (I hope!). Here, teen-genius helps the box and me out to the car. We posted the box to Ohio, and hope to hear soon that the main office has received it and sent it on to its first reviewer. And I’ve also got another incarnation of my new Square-Top Hat pattern going. Then, I pulled my hibernating Kilt Hose out and decided I didn’t like how this arrangement of calf-increases looks. So, I ripped back the last 3 increase-pairs and have devised a new plan. We shall see. And maybe a bunny, maybe a skirt, maybe that entrelac shawl,will also be added/restored as Works in Progress.
. . . while I wait to hear about Level 2. Another Fair Isle pattern band done! I intend the finished product to be for my 8-year-old DD. Then there’ll be more swatches, projects, and reports. . . .
And, also very exciting to me, I just completed the “Autumn Colors” pattern band in my Fair Isle sampler. I drew the motifs and colors from Betts Lampers’ cardigan design, “Autumn Colors Fair Isle”, in Sweaters from Camp, a soon-to-be-out-of-print book from Schoolhouse Press. 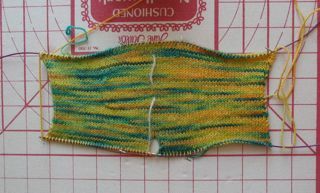 I have had the next band in mind for some time: same motifs, but interlocking, and done in Noro sock yarn on an off-white background. You can see the barest beginnings of it at the photo’s top. I wonder how many rounds I’ll get before the yarn changes color? I had to tink back 3 times before I got the colors aligned properly, but I’m hoping I can forge ahead from here.